Since 1963, Premium Pizza With a Personal Touch. When Jim Grote was a 13-year-old in Columbus, Ohio, he took a job making pizzas. By the time he was a sophomore at Ohio State University, the pizza business had hooked Jim for life. Jim bought that original shop in 1963 for $1,300, and kept the clever original name – a play on a Latin phrase that means “to give a good thing.” It was a perfect way to describe what would become his three-part mission: to create a superior product, hire great people, and promote goodwill in business and the community. As the business grew, Jim raised his family in a home behind that first pizza shop. 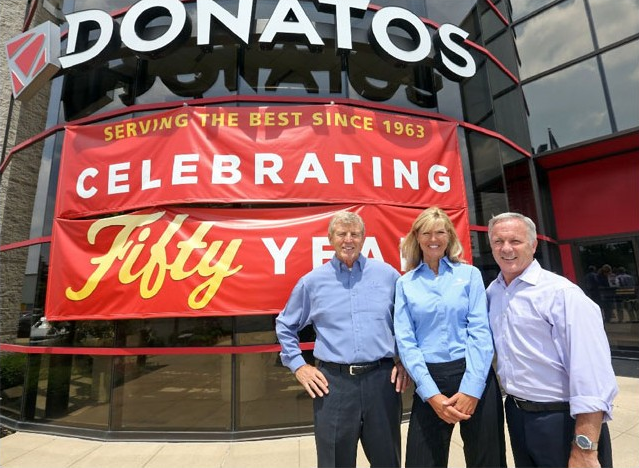 This mix of work, friends and family helped define Donatos’ distinctive culture. Today, our family-owned company remains a favorite in Columbus and well beyond, with more than 150 locations in nine states. Working with his daughter, Donatos Chairman Jane Grote Abell, Jim remains a guiding influence at the company, making sure his original values continue to shape everything we do. Jim’s generosity is about more than our ample premium pizza toppings, the Edge to Edge® mantra we’re known for. It’s also evident in the way we care about serving our customers the very best pizza, the way we treat our associates like family and the way we always strive to be a good neighbor and positive community influence. The result: an incredibly loyal fan base that just keeps growing.